What Are the Questions to Ask When Leasing a Car? Do You Need a Credit History to Lease a Vehicle? Before leasing a car, there are several key questions to ask dealers, which should be answered to your complete satisfaction. You obviously want to secure the best available leasing terms. By understanding car-leasing fundamentals, along with the various options at your disposal, you can negotiate the right deal—one that simultaneously complements your current financial situation and saves you money over the lease’s lifetime. Generally speaking, car dealers have only one negotiating card in their decks: vehicle pricing. Dealers work as agents for the leasing institutions, which typically establish such essentials as down payment requirements, security deposits and acquisition fees. This is precisely why it is wise to inquire what items in the lease contract are negotiable, and what items are set in stone. With this knowledge in hand, you can further your quest for the most favorable leasing arrangement. Query dealers, too, about their leasing company and whether you can use the services of an outside party. While most automobile shoppers are unaware of this financing alternative, it nonetheless exists. Ordinarily, car dealerships work with their manufacturers’ financial arms, such as Ford Motor Credit and American Honda Finance Corporation. However, if you are not wholly convinced that the available leasing terms at the dealerships are optimum, and you feel you can obtain more propitious terms elsewhere, then by all means explore prospects in banks, credit unions, and car-leasing concerns with no relationships with automobile manufacturers. The bottom line is that you want the best possible terms, and sometimes they are not through a car dealership. Check out PrimeLease at www.primelease.com for more information on these lease-financing alternatives. How Long Is the Average Car Loan? What Is a 5 Year Auto Lease? What Are Typical Car Lease Interest Rates? Are there better times of the year than others to lease a car? Yes. You can often land a preeminent leasing deal when the car manufacturer offers promotional discounts. Discounts from the automobile company, as well as the individual dealer, are one-two punches that work to your advantage. Inquire about forthcoming promotions. You can always bargain with dealers on price. But having the automobile manufacturer kicking in on the pricing discount is optimal. 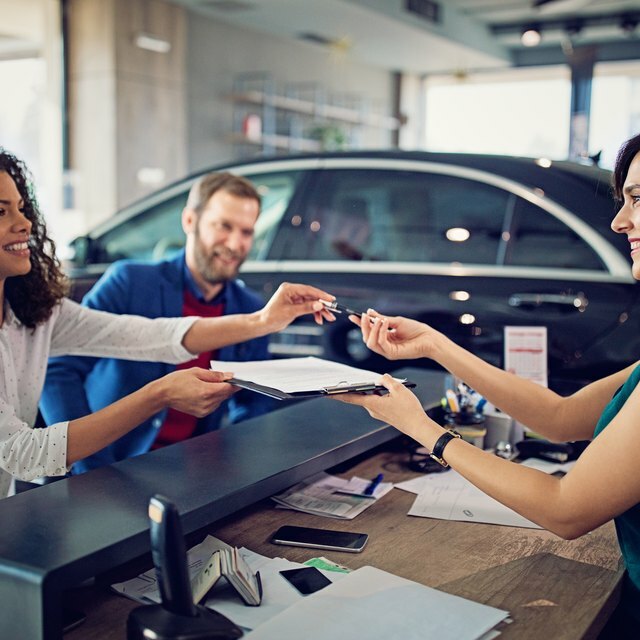 Querying car dealers about the benefits of purchasing a vehicle outright, versus leasing one, can also prove extremely enlightening. When you enter into any sort of leasing agreement, you are financing the use of a vehicle—period. There is no ownership involved. This reality bite is exactly why the answer to this question is so significant. Ask yourself whether the lower monthly payments of a leasing contract—versus a purchase—is both necessary and in your short-term and long-term interests. Purchasing a mode of transportation, as opposed to leasing one, typically amounts to genuine savings over time. Nevertheless, with a lease, you are only paying for a fraction of the vehicle’s overall value, and, in many instances, do not even need a down payment. In addition, to purchase a vehicle, you will be required to pay an interest rate commensurate with your creditworthiness. If your credit is less than stellar, this would entail a high interest rate and considerable monthly payment. Based on your credit score, you might be ineligible for a loan. Your current monetary situation and personal circumstances assume the definitive role in whether leasing or buying a car is right for you. It also clues you on what monthly leasing payment you can afford both immediately and in the coming months and years. Nicholas Nigro has more than fifteen years as a professional writer. He is the author of several books, including "The Everything Coaching and Mentoring Book," "101 Best Businesses for Pet Lovers," and "No Job? No Prob!" Nigro holds a Bachelor of Science degree in economics from Manhattan College.